The Colorado River Compact (1922) and the Upper Colorado River Basin Compact (1948) do not affect obligations to Native American interests. Article VII and Article XIX, respectively, of the 1922 and 1948 compacts provide that: Nothing in this compact shall be construed as affecting the obligations of the United States of America to Indian Tribes. The Colorado River Storage Project Act of 1956, the Colorado River Basin Project Act of 1968, and the associated Criteria for Coordinated Long-Range Operation of Colorado River Reservoirs (Long-Range Operating Criteria) did not alter these compact provisions. There are 29 indian tribes within the Colorado River Basin with vested water rights of slighty more than 2,900,000 acre-feet. Only fifteen tribes are recognized by the federal government. Ten of the Colorado River tribes are organized as a coalition called the Ten Tribe Partnership and advocate for a greater tribal voice in management of the Colorado River Basin. The tribes hold senior water rights due to a legal decision made in 1908 called the Winters Doctrine, or sometimes called the Federal Reserved Rights Doctrine. The priority date for such water rights are typically based on when the reservation was established, which usually pre-dates all other water rights by the dominant hydrosociety. Many tribes have quantified their water rights, somtimes through litigation or settlement, and others hold claims to water that have yet to be quantified and perfected. Here are links to learn about the tribes on the Colorado. 2008 - Declaration on the Rights of Indigenous Peoples. United Nations. 2018 - Indigenous Water Justice. Robison et al. Recognized Indian Entities (2015). Federal Register. Tribal Leadership Directory (2015). Bureau of Indian Affairs. 2018 - Tribal Water Study of the Ten-Tribe Partnership (documents combined and starting with the press release). This study is a new feature of the 2012 Basin Study. MAP: tribal lands in the Colorado River Basin. Pontius. 2013 - Testimony of Ten Tribe Partnership. Vigil. 1980 - Navajo Water Rights: Pulling the Plug in the Colorado River. Back. 1987 - Cultural Perspectives on Indian Education: Comparative Analysis of Ute Anglo Cultures. Cuch. 1988 - Management and Marketing of Indian Water: From Conflict to Pragmatism. Getches. 1997 - Colorado River Governance: Sharing Federal Authority as an Incentive to Create a New Institution. Getches. 2012 - Tribal Water Demand Appendix. 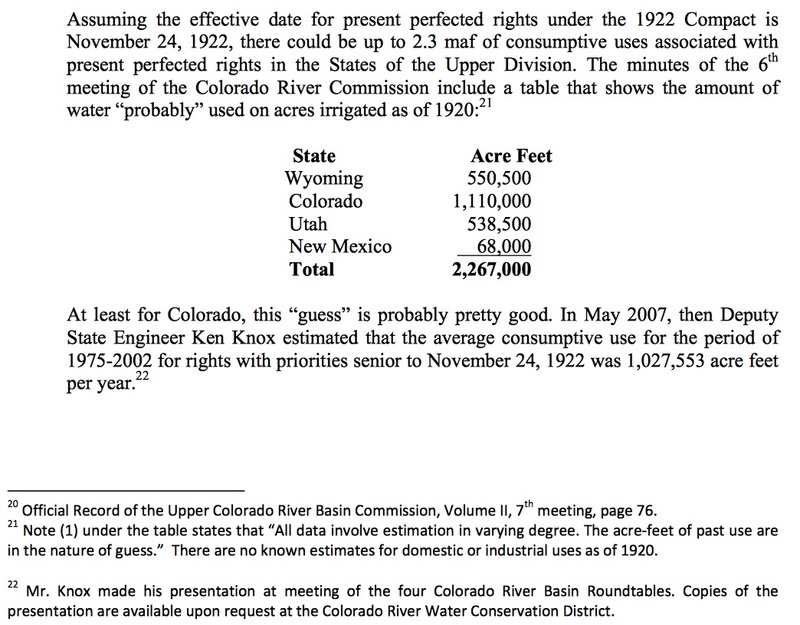 Basin Study, USBR. 2013 - Cross Jurisdictional Water Marketing. CRGI. 2014 - Indian Water Rights: How Arizona v California Left an Unwanted Cloud Over the Colorado River Basin. Cordalis. 2014 - Tribal Trustees In Climate Change. Wood. 2016 - Tribes and Water in the Colorado River Basin. Colorado River Research Group. Outline of United States Federal Indian Law and Policy.Wikipedia. 1996 - Executive Order 13007. Indian Sacred Sites. 2009 - Secretarial Order 3285. Renewable Energy Development. 2009 - Secretarial Order 3292. Individual Indian Trust Management. 2014 - Department of the Interior Order 3335: Reaffirmation of the Federal Trust Responsibility to Federally Recognized Indian Tribes and Individual Indian Beneficiaries. Summer Research Aprenticeship Program. Univ. of Wyoming. Tribal Water Rights & Uses in the Colorado River Basin. Ten Tribe Partnership. Tribal Water Use in the Colorado River Basin. University of Colorado Law School. Estimate:Upper Basin Present Perfected Rights. Kuhn, 2012. McCarran Amendment and the Administration of Tribal Reserved Water Rights. Stein. Native American Water Rights Settlement Project. UNM. 2011 - Tribes Without Water Settlements. Reclamation. 2015 - Settlements Approved by Congress. WSWC. The American Indian Cultural Support organization is dedicated to preserving our various Nations sovereignty, legal rights, lands, and cultures. Through applied research and service, the Harvard Project aims to understand and foster the conditions under which sustained, self-determined social and economic development is achieved among American Indian nations. The Harvard Project's core activities include research, advisory services, education and the administration of a tribal governance awards program. Established in 1992 with a vison to assist Indian Tribes in the management of their environmental resources through effective training and education programs. Inter Tribal Council of Arizona (21 tribes). The Inter Tribal Council of Arizona was established in 1952 to provide a united voice for tribal governments located in the State of Arizona to address common issues of concerns. On July 9, 1975, the council established a private, non-profit corporation, Inter Tribal Council of Arizona, Inc.(ITCA), under the laws of the State of Arizona to promote Indian self-reliance through public policy development. National Congress of American Indians. (NCAI) was founded in response to termination and assimilation policies that the United States forced upon the tribal governments in contradiction of their treaty rights and status as sovereigns. NCAI stressed the need for unity and cooperation among tribal governments for the protection of their treaty and sovereign rights. Since 1944, the National Congress of American Indians has been working to inform the public and Congress on the governmental rights of American Indians and Alaska Natives. Native American Legal Materials. Washburn University. NNI was founded in 2001 by the Morris K. Udall Foundation and The University of Arizona as a self-determination, self-governance, and development resource for Native nations. Colorado Law's American Indian Law Program and Law Clinic provides students with comprehensive opportunities to acquire specialized knowledge of American Indian law, through curriculum and resources. 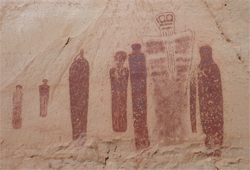 Utah American Indian Digital Archive. The Utah American Indian Digital Archive (UAIDA) is a gateway to the best resources regarding Utahs Indian tribes.